It's this phrase that's put out there following an ill-spent attempt at conveying the impact of an experience, the event's resonating effects still mapped throughout your grey matter yet impossible to express verbally to anyone unable to comprehend the time and space of the where and when. I talk about the 90s quite a bit, aware that my era of self-discovery means nothing in the here and now, JUST the where and when, and that articulating these feelings may often yield little or no reaction. Because you had to be there. And, I admit to sometimes missing that decade. I've done my damnedest to look ahead, to never be indoctrinated into that insufferable collection of unmovable mid-lifers content to reside in a state of permanent reminiscence. I try and focus on relevant, i.e. "now," music. But, as this point in time was where I began to understand how I identify musically and where my passions lie, there's a feeling I used to get back then when I would pick up a new album, bonding with it in a way that, at times, meant more to me than human or spiritual connection. And it seemed to happen all the time. For a couple of solid years, maybe between my 15th and 17th years especially, I was emotionally affected by whatever was running from my Walkman to my ears. And so many of these experiential albums came out in 1992, twenty-five years ago, which is a deeply overwhelming realization. Three of these albums were The End of Silence by Rollins Band, Angel Dust by Faith No More, and Meantime by Helmet. In 1997, though, this feeling I'd had dissolved and that once-enthralling period of seemingly endless and abundant "alternative" music had grown banal and recycled, appropriated and drained of any worth by the powers-that-be, FM radio, and MTV. I'd responded by hitting up hip-hop. Wu-Tang Clan's very stuffed two-volume opus, Wu-Tang Forever, was all I'd listened to that entire summer. But, it did seem that the new population of young(er) people were offered very saccharine and superficial options to satisfy their need for a musical identity, post-Disney youth with inescapable hooks, trivial needs and pursuits, and a whole lot of glamour. Nü metal was for the angry kids and even THAT qualified for airplay on Total Request Live. And, while I noticed this overall shift toward America's new focus and realized that music fans of my ilk were no longer part of the conversation, three releases signaled, for me anyway, the sad finality of the era and proved to be the end days for those bands responsible: Come In and Burn by Rollins Band, Album of the Year by Faith No More, and Aftertaste by Helmet. The same bands provided as much of a beginning as they did an end. Now, I realize that I may be inflating the impact and importance of these albums, being as they are the respective works of bands who, in the eyes of many, may amount to little more than one-pump chumps, (or, in less vulgar terms, "one-hit wonders"). I obviously hold them in higher regard than that, but I also recognize that I'm part of a niche group of appreciators. Devotees. Still, as tastes had shifted, the environs with which bands relegated to "alt" status could once thrive were no longer available. And while other circumstances led to the dissolution of Rollins Band, Faith No More, and Helmet, certainly demographics mattered. As Rolling Stone had pointed out in a review of Album of the Year, "...Faith No More are floundering around desperately, groping for a sense of identity and direction in a decade that clearly finds them irrelevant." I don't agree with the review, but assessing the album that Faith No More had produced against the direction the decade was going, yeah, it clearly wasn't a relevant album. And the same could be said for Come In and Burn and Aftertaste as well. But, with that said, this is the point when personal taste and cultural significance diverge. If you think about the myriad bands whose efforts once garnered mass attention and adoration, whose albums sold, whose charisma and star power won fan affection, whose success was followed by a period of sudden disinterest from their once-loving and fickle public as soon as something new came along, these flash-in-the-pan performers still have fans who will come out, spend cash, and see them play. Yes, the glory days are over, but people are willing to shell out money for nostalgia or genuine fandom. I digress slightly, but the point is that an audience exists for bands past their prime. So, for me, Come In and Burn, Album of the Year, and Aftertaste, while I do consider them cultural barometers, stand as solid installments with plenty of merit. Having hit their stride with bassist Melvin Gibbs, who'd been newly acquired just before the band had recorded Weight, Rollins Band sounded more cohesive with Come In and Burn, its funk-laden and jazz-infused vitriol grounded in anxiety ("Shame"), anger ("Starve"), lamentation ("Saying Goodbye Again"), and introspection ("Thursday Afternoon"). The sessions for Come In And Burn also produced one of the band's best tracks with "Also Ran," a B-side that wound up appearing in the Come In And Burn Sessions album, independently released through Henry Rollins's 2.13.61 imprint. Come In And Burn was a clear progression in sound, but would be, unfortunately, the band's final release with this line-up. There was an attempted reunion in 2006, but it didn’t gain any traction. Faith No More thankfully had it in them to come up with “Stripsearch,” "Last Cup of Sorrow," “Helpless,” and "Ashes to Ashes" before they called it quits, (at least until the band came back together and produced 2015’s Sol Invictus). With its self-deprecating quip of a title, Album of the Year does lack some cohesion and I won’t deny that there were signs that FNM’s creative relationship sounds as if it’s stagnating. The band’s approach to songwriting with 1995’s King For a Day… Fool For a Lifetime, which was also received with mixed praise upon release, could very well have provided the basis for Album of the Year, FNM’s shift in direction marrying some very odd musical ideas (“The Gentle Art of Making Enemies,” “Cuckoo for Caca”) with more pop-friendly excursions (“Evidence,” “Star A.D.”) and the relatively familiar (“Digging the Grave,” “The Last to Know”). While one could perceive this exploration as challenging to fans expecting more of the same, and some of their more ardent fans do consider King For a Day to be FNM’s true masterpiece, Album of the Year could justifiably have been viewed as a regurgitation of King For a Day’s layout, reducing risk to formula. Album of the Year has benefitted from time and hindsight, though, with songs like “Collision,” “Naked in Front of the Computer,” and “Mouth to Mouth” sounding less paint-by-numbers and its lighter, more melodic offerings like “She Loves Me Not” not much of a stretch sequenced against the more immediate “Got That Feeling.” And with Sol Invictus having now released Album of the Year from being the band’s last hurrah, it’s now viewed with less finality. Helmet’s Aftertaste is not the high intensity, off-kilter outing that its predecessors (Strap It On, Meantime, and Betty) were, but Page Hamilton’s very sober and textural follow-up remains a sturdy addition to the band’s discography. 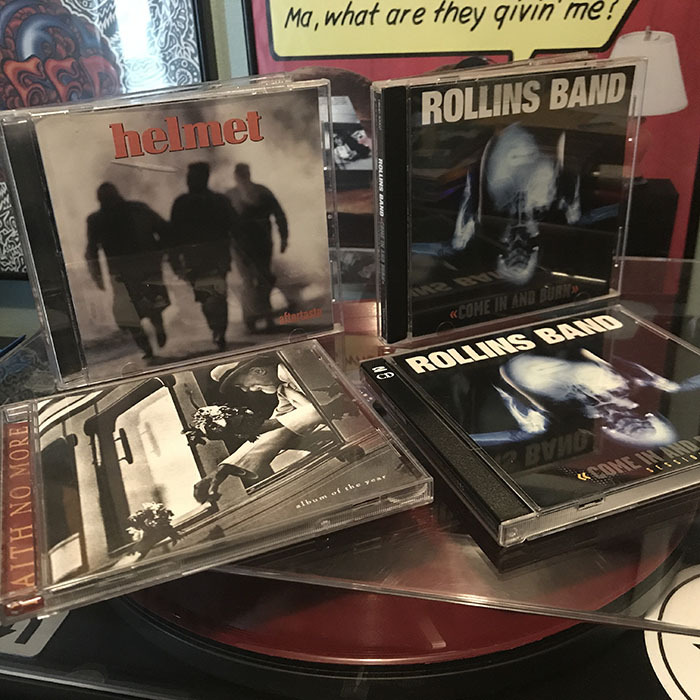 Being Helmet’s last release from the original line-up, (Hamilton would revive Helmet in 2004 with a new line-up and a new album, Size Matters), Aftertaste was recorded as a three-piece following the departure of guitarist Rob Echeverria, who would join Biohazard. While Hamilton’s very direct approach to song craft offers little in the way of invention, Aftertaste succeeds better at emotion than it does aggressiveness, the thick, down-tuned resignation of “Like I Care” and the pensive “Driving Nowhere” standouts next to the more predictable “Birth Defect” and “Insatiable.” I’ve also always loved how the album opens with “Pure,” its verses driven by one of my favorite Hamilton riffs. Since Aftertaste, Hamilton has released four Helmet records, none of which have replicated or matched the vitality and fluidity of that first line-up. I got to see Helmet a lot in the 90s, happy to have witnessed that relationship at work, a well-honed exchange of depth and noise, rhythm and force. You had to be there. It’s too bad if you weren’t.